Thank you for leading a project for this year’s SOLVE Beach & Riverside Cleanup! Please review this page in its entirety, and begin by familiarizing yourself with the roles and expectations of both SOLVE and project coordinators. If your project is on Sept 29, please call our office by 3pm at 503-844-9571 with your preliminary results so we can include that in a statewide day-of-event press release. SOLVE requires written property owner/manager permission for all volunteer projects. Please use the appropriate permission form: Private Property, Public Property, or State Agency Owned Property. Property owner permission forms should be submitted to SOLVE by August 24. Scan and send your form to joy@solveoregon.org or mail to: SOLVE, Attn: Joy Hawkins, 2000 SW 1st Ave, Ste. 400, Portland, OR 97201. All volunteers must sign a SOLVE volunteer waiver form prior to participating in an event. If you have any questions about this policy, or if you have your own waiver that you are required to use, please contact SOLVE as soon as possible. Adult waivers and youth waivers can be downloaded and printed prior to the event. You will receive some printed waivers with your supply order. SOLVE provides free materials such as litter bags, vinyl gloves, safety vests, first aid kits, and sharps containers. Please order supplies by the August 24 deadline so we will have time to fill orders to ship or deliver on the road trip. A limited number of small grants of up to $100 for qualifying expenses are available. A grant application must be completed by August 24 in order to be considered for funding. After the event, you must submit a small grant reimbursement form with reciepts to SOLVE within 30 days. If there are food items, recognition gifts, or other items that you would like that aren't covered by the small grant, many local businesses will likely be interested in donating to your project. If you acquire any in-kind donations, please have the business fill out SOLVE's In-kind Donation Form. Send this back to SOLVE so we can thank them personally. The form also includes our tax-id number which may help entice a business to donate! SOLVE provides assistance with volunteer recruitment and placement, including online volunteer registration, waiver forms and confirmation emails to all online registrants. Coordinators are expected to provide outreach to local groups in an effort to bring volunteers to your event project. SOLVE provides an editable flyer (below), in addition to statewide event advertisement. Volunteer registration opens on July 23 and you may direct volunteers to sign up beginning that day. Adults who sign up on the website will be able to sign an electronic waiver form, which will save time on the day of the event. After volunteers are registered for your project, they will receive a confirmation email with important project details as we have them from you. If your project is closed to community volunteers, your project will not be listed on the website. 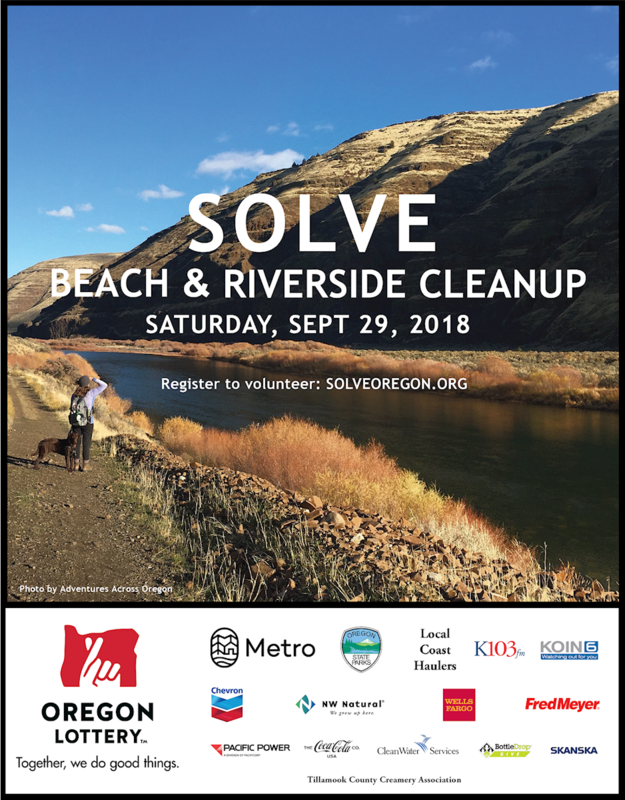 Please note that our statewide outreach for the Beach & Riverside Cleanup will advertise the event as running from 10-1pm with a note that project times vary. If your project spans a different time frame, you may want to emphasize that in your local outreach to minimize confusion. Make arrangements for waste disposal at your site(s) with your local hauler, park, etc. Please call us if you need help with this. Recycling: If it makes sense at your site, consider recycling to divert waste away from landfills, contact your hauler about the best way to sort recyclables for pickup, and suggest to volunteers that they head out in pairs with one person carrying a recyclables bag and the other a landfill trash bag. Use buckets and/or consolidate bags whenever possible. View our Recycling Resources Page. Do not work above your ability. List site hazards such as stinging nettle, steep slopes, water bodies, etc. Contact the project coordinator if you receive an injury. SOLVE offers Coordinators use of the Project Planning Resource Guide, a step-by-step manual to coordinating a SOLVE project. Coordinators are also free to contact SOLVE staff directly for project support. Contact Joy Hawkins at joy@solveoregon.org or 503-844-9571 x317. State law requires residents, contractors and anyone planning to dig anywhere in the state to call the Utility Notification Center at 811 at least 48 hours before digging. This is a free service. Help SOLVE Collect Litter Data! The Beach & Riverside Cleanup is part of the International Coastal Cleanup (which includes inland waterways, too). Over the past 30 years, Ocean Conservancy’s International Coastal Cleanup has become the world’s largest volunteer effort for ocean health. The Ocean Conservancy provides litter data cards for volunteers to record litter types and quantities to track trends in trash. If you are leading a litter cleanup, we will be providing data cards with your supplies. Volunteer education is a top priority for SOLVE. Volunteers are often more motivated when they understand the full impact of their work. Please review the SOLVE educational webpages for ideas on information to share with your volunteers.